There is so much advice out there on weaning babies, and every generation has its own rules and regulations. These rules might be always changing (the advice on feeding babies peanuts, for example), but when it comes to babies, I've always held by my mother-in-law's advice that mommy knows best. Yes, mommy might need a bit of help from Dear Mother Google, but by and large, we are always aware of our babies' needs and the best way to fulfil them. When it comes to food, babies are such a blank slate, but at the same time, pretty strong minded. Adz, for example, never ate potatoes as a baby. I remember feeding her a pilau once that had the tiniest bits of potatoes, and when I looked over, that child had picked out every since scrap of potatoes (from rice!) and put them aside. Baby Sky, on the other hand, is a little food monster and will gobble up everything you feed him, and then whine for more. Adz and I thought we would have a little bit of fun with him, and gave him a slice of lime one day. That little creature sucked the entire lime, and then looked at us with a big smile and went, mmm! So, considering that he seemed pretty happy with experimenting with food, I decided to start spice early on. I am Indian, after all, and spice is a huge part of my life and cooking. 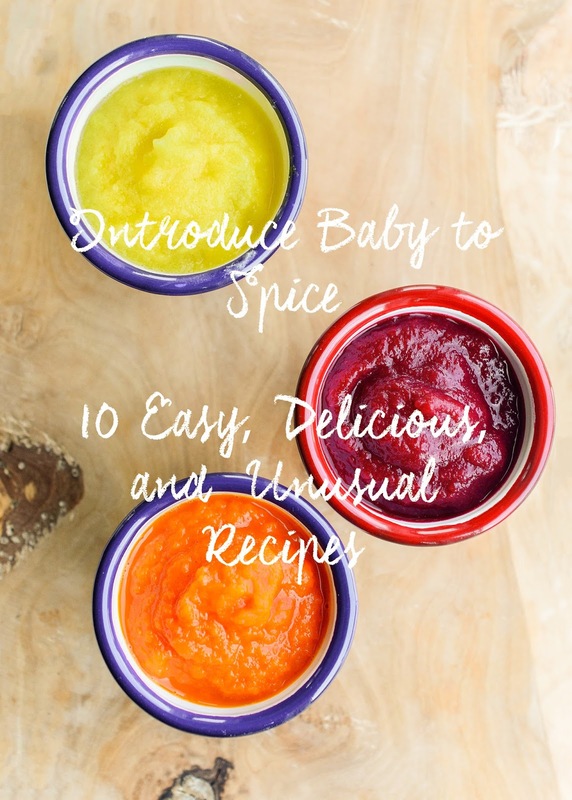 I came up with quite a few combinations to include spices in his everyday food, and the ten recipes below are an unusual, yet, perfect spice primer for your little gourmet. If you need more information on any of the spices I use, I write The Spice Box column on FBC, which has information on every spice and herb you need. Peel, core and chop any ripe apples or pears of your choice. Place in a pot with water and add a star anise, 4 cloves and a stick of cinnamon. Stew until apples and pears are soft. Remove the anise, cloves and cinnamon stick and blend. The strong flavour of beets pairs well with this middle eastern spice mix. You can make your own za'atar (leaving out the salt). Apples add a touch of sweetness to the puree. Boil (or roast) 4 small beets, until just tender. Add a peeled, cored and chopped apple to the water and boil together until soft. Place in a blender with 1/4 teaspoon za'atar. Blend to a puree. I love the flavour of hot harissa, but I use it very sparingly in this recipe. The roasted red pepper is very sweet and helps balance out the heat of the spice paste, and this is a perfect recipe to introduce baby to a little chili pepper. Make your own harissa to control spiciness and salt, if you want, but you can also use shop bought paste, once you taste and add just enough so that the mixture is not too spicy. Preheat oven to 400F. Place two whole red peppers on a heavy roasting tray, and roast for 40 minutes, turning them once. Take out of the oven and place in a ziplock bag (this will make the peppers easier to peel). When still hot, take the peppers out of the bag, and peel, discarding seeds, stalk and skins. 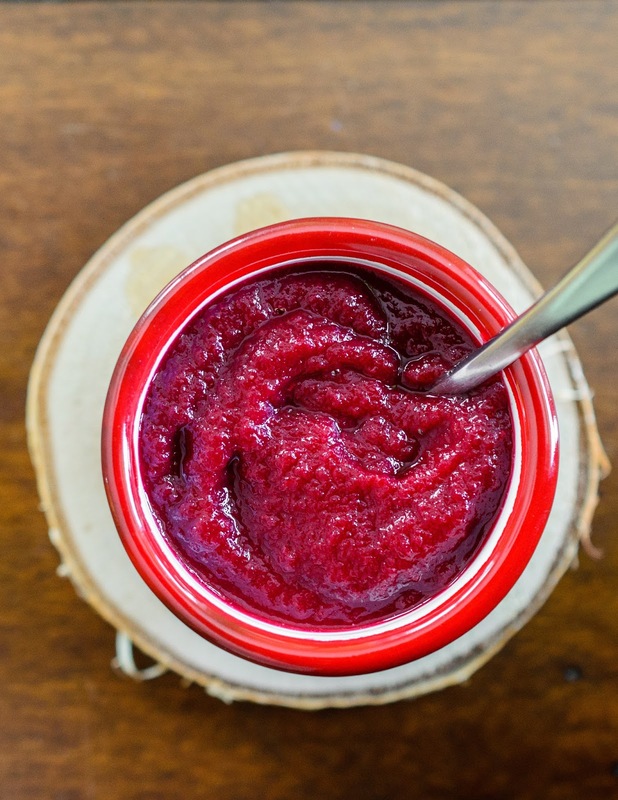 Place in a blender with 1/4 teaspoon of harissa and blend to a puree. Being of Indian origin, spices are a very important part of my life. 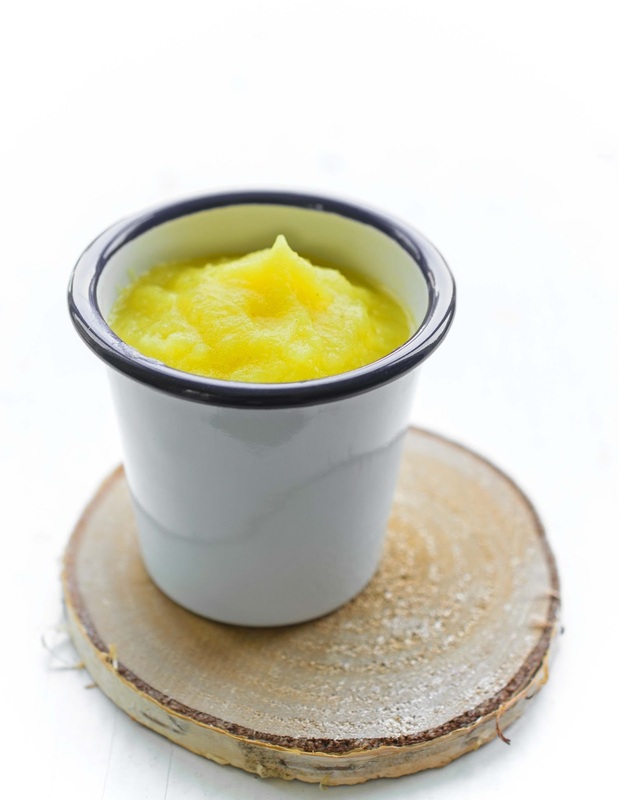 My Madras Curry Powder is one of the best known recipes on my blog and I love to add a titch to cauliflower to make this simple, delicious puree. This is one of Baby Sky's favourite recipes, and strong flavour of cauliflower is perfect with the spice mix. If using shop bought curry powder, use the mild version. Preheat oven to 400F. Brush a roasting tray with a little grapeseed oil. Slice half a cauliflower into thick 'steaks', and place on the tray. Sprinkle with about 1/4 - 1/2 teaspoon of Madras curry powder and drizzle with a little more oil. Roast the cauliflower for 30 minutes, turning once, until soft. Blend to a puree, adding a splash of water, if needed. This recipe is very reminiscent of warm, woody flavours and is also a Baby Sky favourite. Preheat oven to 400F. Peel and chop a small butternut or buttercup squash, coring out the seeds. Place on a baking tray and grate over 1/4 of a nutmeg, and sprinkle over a pinch of cinnamon and allspice. Drizzle with grapeseed oil. Roast for 30 minutes, or until soft and blend. This is another easy recipe. You can find Berbere spice mix in most Arabic or spice stores. As this Ethiopian spice mix can be pretty spicy, I just add a tiny hint of it to the carrots. Preheat oven to 400F. Place 4 peeled and chopped carrots on a heavy roasting tray and drizzle with a splash of grapeseed oil. Sprinkle a pinch of berbere spice on the carrots and roast for 30 minutes, until soft. Blend to a puree. 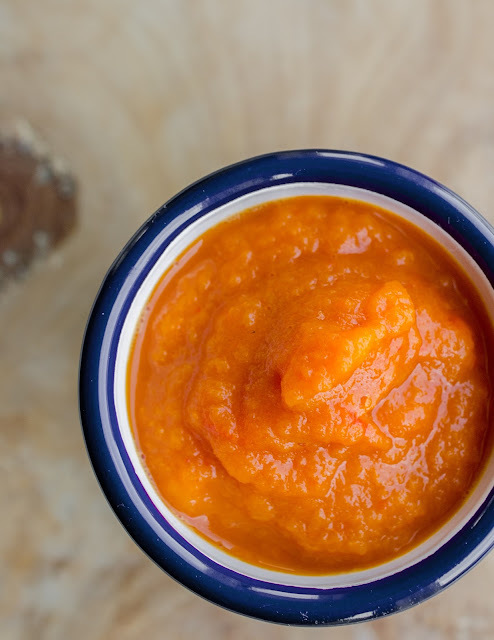 This is one of my favourite side dishes, and it's a simple cinch to make it baby friendly. Peel, chop and boil one large potato until tender. Drain. Add a splash of grapeseed oil to a pan and add the potatoes and 1/2 teaspoon of cumin. Fry for a few minutes, then transfer to a blender with a small handful of fresh cilantro leaves. Blend to a puree. You can replace the potatoes with sweet potatoes, for a different flavour, or use a combination of both. Another recipe with Middle-Eastern flavours, this one was inspired by one of my favourite chefs, Ottolenghi. The use of citrus is optional (there is advice both for and against introducing citrus into baby's diet before one year), but I like to add some lemon zest for a nice, fresh flavour. Leave it out, if you wish. Preheat oven to 400F. Place one large eggplant and two whole, unpeeled cloves of garlic, on a roasting tray and using the tip of a sharp knife, pierce a few holes all over both (otherwise, it might explode, yes, speaking from experience here!) Roast the garlic for 30 minutes and the eggplant for 1 hour, turning over once. Take out of the oven and let cool a little. Peel the garlic and eggplant and place the flesh in a blender. Add a teaspoon of tahini, 1/2 teaspoom lemon zest and a small handful of fresh parsley and blend to a puree. Dal is a classic in India. For Baby Sky, I leave out the copious amounts of salt. Place 3/4 cup of rinsed split red lentils in a small pot and cover with cold water. Bring to a boil, skimming off any scum that rises to the surface. Boil for 20 minutes, until soft and add 1/2 teaspoon each, turmeric, ground cumin and ground coriander. Blend to a puree, adding more water, if required. This is another simple recipe, full of protein for baby. You can replace the pinto beans with any other kind of beans or chickpeas. I use a mild smoked paprika for this recipe. You can use canned beans for this recipe, just rinse them out before blending, which makes life a lot easier. Place 1/4 cup of dried pinto beans in a large bowl and cover with cold water. Soak overnight. The next day, rinse the beans out, discarding the soaking water and place in a heavy based pot. Cover with cold water, bring to a boil and boil for about 45 minutes, or until the beans are tender. Drain and place in a blender with 1 chopped red pepper and 3/4 teaspoon of smoked paprika. Blend to a puree. You can also replace the fresh red pepper with a roasted and peeled pepper. See tips for cooking beans here. These are just a small collection of recipes for baby. You are pretty much only limited by your imagination when it comes to spicing up baby's life, of course! Wow. I like all the recipes that you have shared here. Although not tried yet, but will try soon to make all these at my home.